Mindfulness and Emotional Intelligence (EI) have become acknowledged as key elements of success, outstanding performance, happiness and good health. · Strategies and strengths of Self-worth, Self-Mastery, the awareness of others and being able to value others. Lisa Spencer-Arnell has built up a very successful career as an International Consultant & Coach, Inspirational Speaker and Published Author. Her work on Mindfulness and Emotional Intelligence have been widely praised and recognised. We only have a limited number of spaces to attend so please register on Eventbrite ASAP to confirm your place on the link below. 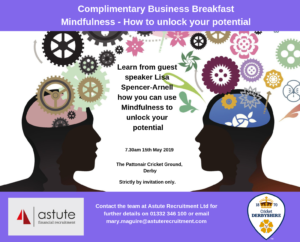 Please let us know if the breakfast event could be of interest and confirm your attendance on Eventbrite by clicking HERE to reserve your place!